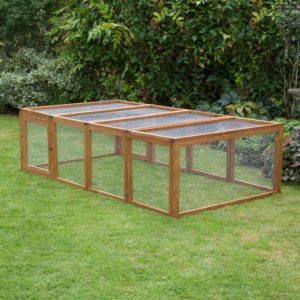 If you want a safe place for your guinea pig to run and play then a folding guinea pig run is the perfect option. It provides guinea pigs with plenty of exercise while still protecting them from predators. At Home & Roost we have a great selection of folding runs that are perfect for anyone who wants to give their pets a run but does not want it up all year. Our folding runs fold flat so they can easily be stored in a shed or garage. They are also easy to set up so putting them back up when you want them is a breeze. Whenever we design a folding guinea pig hutch we make sure to put your pets first. That means making sure there are no sharp edges, places pets could get caught or other flaws. 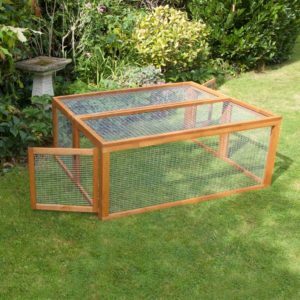 We use galvanised 1 inch by 0.5 inch wire mesh to keep your guinea pig safe from predators. This sized mesh also prevents them from getting caught in the wire. We also treat all of our wood with a water based pet safe wood preservative because we know how much guinea pigs love to nibble. We even design our runs to be tall enough for your guinea pig to be able to stand on its hind legs. If you are thinking of buying a folding guinea pig run, we would suggest purchasing a few other accessories. A run does not provide any shade so a run shade is important. It will prevent your guinea pigs from overheating on warm days. We also suggest a few toys to keep your guinea pigs entertained. This is important as they need something to occupy their mind. 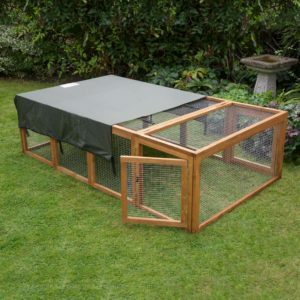 Our folding runs are perfect for any guinea pig owner. If you have a small garden they make it easy to set up a run without permanently devoting space to one. Folding runs also work well if you want to store your run during the winter months when your guinea pigs may not want to go out. Two people can easily move one of our folding runs around even when it is set up so you can also transport it to new places. 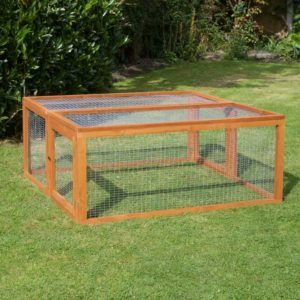 This can help prevent your grass from being nibbled too much and gives your guinea pigs a nice new place to explore.